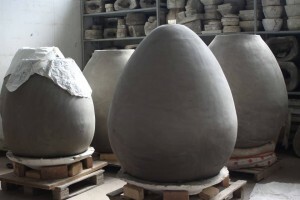 Egg shaped wine jars in the firm of Artenova. 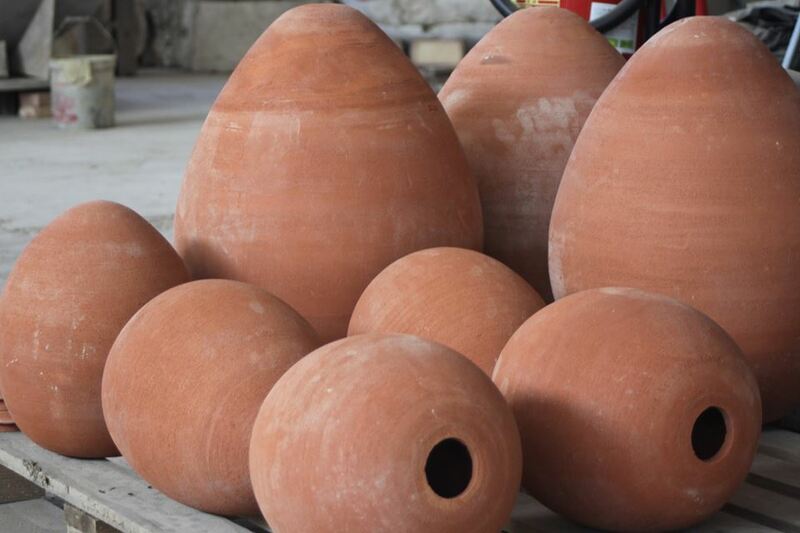 Easter News: Artenova Terracotta continue their production of egg shaped wine jars. In the coming months they will be making these elegant harmonious vessels in various sizes. Inside an egg shaped vessel there are “no corners” so the wine undergoes a continuous spiral like movement reminiscent of those in flowforms: Inside the jars wine moves at different speeds, slower around the edges and faster towards the middle and downwards. When it reaches the bottom, fermentation causes the wine to heat up and rise towards the top where it reaches its highest temperature. The process then starts over again. In this way the cooler wine at the bottom of the jar is mixed continuously with the warmer wine at the top. The continuous movements of the wine also keep the lees in suspension in gentle spirals: for the maturation and aging of wine it is very important to maintain contact with the lees, especially when it comes to white wines. Therefore this natural movement similar to a light but continuous batonnage is very beneficial. It is due to these particular characteristics that egg-shaped jars are considered an innovative breakthrough in the wine scene. Egg shaped vessels in cement are fairly widespread throughout France. Made by the company Nomblot in Burgundy, the cement used is free from iron or toxic chemicals. However for terracotta jars the clay from Impruneta is what makes the difference: not all terracotta is the same, and that of Impruneta has been proved extraordinary for its physical and chemical characteristics. Optimal in terms of chemical make up, Impruneta terracotta guarantees total tranquillity concerning the transmission of heavy metals. This last aspect, in particular, is becoming an increasingly important priority in the selection of raw materials for the production of vessels suitable for use in winemaking.